In a country full of stunning tropical islands, Camiguin stands out as one of the best places to go to. Located in the Bohol sea just north of Mindanao, Camiguin is the 2nd smallest province in the Philippines. This volcanic island is completely covered with lush jungles and surrounded by pristine beaches – making it the perfect destination for nature lovers. Even though the island is small, it is quite developed and offers visitors excellent resorts, tours and a nice nightlife, offering a perfect mixture of privacy and touristic attractions. All this makes Camiguin a great choice for families and couples alike. Our agency offers complete Camiguin packages which include hotels, tours and transfers – we promise the best deals you can find. Build your own fully custom itinerary with us and discover everything this stunning island has to offer. 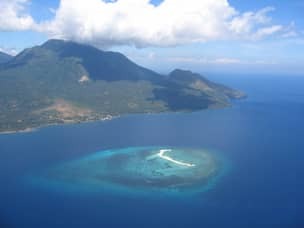 As mentioned, Camiguin is a small island so there is no reason you shouldn’t be able to experience everything it has to offer in a just a short time. Camiguin’s location makes it an ideal stopping point for those looking to build a larger travel itinerary, as it lies right between Visayas and Mindanao. We also offer day tours and activities for those already in Camiguin island. Read further down this page to find everything there is to do on the island. Camiguin is a tropical paradise and as such, nature related activities are the best way to fill up your days. These include hiking, camping, diving and island hopping , and are available through the resorts we work with. However, we can also help organize a private guided tour for you – so if there’s anything special you’d like to try just make sure to mention it when contacting us. We can also help you build a plan which includes any nearby popular destination you’d like. Such locations include Cebu, Bohol, Siargao or Cagayan De Oro. These all fit well into any itinerary, as long as you have enough time to spend in the country. In order to fully enjoy everything Camiguin has to offer, you’ll need to book at least a 3 nights package. So, we will help you prioritize between other islands and build an efficient itinerary. Since Camiguin is still relatively off the beaten path, finding decent accommodation could prove to be quite a challenge. Hotels on the islands mostly consist of budget to mid-range options – clean, friendly and welcoming but don’t expect anything spectacular. Most beach resorts are around the Mambajao area. Although some claim to hold a 5 star rating, they are actually just bungalows with a few amenities such as free WiFi or a swimming pool. For those reasons, we believe Camiguin is more of a value for money destination. If you are looking for a luxury island vacation, there are much better destinations to choose. So, we only present resorts we feel are most likely to satisfy your needs while offering the best deals possible. Browse through our catalog of recommended hotels, read a detailed review of each, and rest assured we only offer those who have been tested and approved by our experts. Flights : Camiguin does have its own airport (CGM) but there’s just a daily flight coming from Cebu, taking roughly 45 minutes. The flight is usually very early in the morning (around 6:30 AM) so make sure your’e there on time. Another option is flying to Cagayan De Oro and taking the ferry from there. All major airlines fly to CDO, so it might be easier to find a better flight. Just keep in mind Cagayan’s airport is an hour from where you’ll need to go to take the ferry. Ferry : Ferry schedule is unstable and based on demand and port of departure, so its better to contact us for free advice. The best option is taking the fastcraft from Cagayan De Oro – it usually leaves multiple times a day and takes 1.5 hours. There’s also a fastcraft ferry from Bohol, leaving Jagna at 12:00 and arriving to Camiguin 3 hours later. There’s also a boat leaving from Cebu each Friday at 8PM, but it’s a 12-15 hours journey. Getting around : Use a jeepney or a tricycle to reach your resort. Once there, you can ask your hotel’s staff about renting a motorbike, so you can tour the island freely. Best time to visit : Weather is great all year round, so there’s no need to worry. Try to make sure you avoid local holidays since Camiguin is very popular among local tourists. Attractions : Beaches, Trekking, Volcanos, Diving, Wildlife. Local festivals and holidays : Lanzones festival is the biggest event of the year, taking place on the 3rd weekend of October. It’s a 2 day celebration of Mindanao culture and foods, with a parade and celebrations. San Juan Hibok Hibokan, celebrated on June 24th, is a day dedicated to St. John the Baptist. Celebrations are held all throughout the island, mainly at the beach areas. There are 3 main ways to get to Camiguin Island, one by air and two by sea. Flying into Camiguin is the easiest option, but there is only one daily flight from Cebu, leaving at 05:45am and landing 06:10am. This is by far the most convenient and fastest way to get to the island. If you are planning to be in bohol for a part of your vacation, you should consider adding Camiguin to your trip too. That’s because Janga Port in Bohol has boats leaving to Balbagon every day at 12 Noon, arriving 4 hours later. Another option to get to Camiguin Island is from Balingoan Port, Misamis Oriental. Ferrys to Benoni port in Camiguin start at 05:45am until 18:00pm, and travel time is around 1 hour. This port is 2 hours away from Cagayan De Oro, so flying into CDO and arriving in Benoni port is also possible. What to do in Camiguin? Even though Camiguin is a small island, there is plenty to see and a lot of fun activities you can try. Read below to discover the top tourist spots and most popular activities, and add the ones you like most to your wishlist. It is possible to book all of these tours as standalone day tours, and both private and group tours are available. However, we strongly advise you book these as part of a complete package tour. Let us take care of everything and enjoy a worry free holiday. Camiguin is known for its pristine beaches, most notably the White island sandbar. 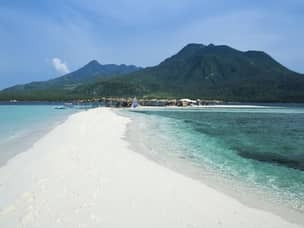 Located just 1.4km from the shore of Mambajao, this uninhabited island is Camiguin’s number one tourist attraction. The island is a perfect place for a relaxing day in the sun, and an amazing secluded beach experience. It is especially nice to go there for sunrise or sunset, since the view is simply breathtaking with Mt.Hibok-Hibok looming in the background. Most resorts will help you book the trip, or you can head to the beach and do it yourself. The ride takes only 15 minutes, and should not cost more than 500 PHP. There are a few vendors on the island, selling beers and soft drinks, so there’s no need to bring those with you. You do, however, want to bring your own snorkeling gear if possible. Even more beautiful than White island is the Mantigue island, just 25 minutes to the east of the main island. Most tourists, even locals, tend to overlook this one and favor the more famous White island instead. We suggest you try both, as each has its own unique vibe and beautiful scenery. Unlike the raw nakedness of White island, Mantigue is actually covered with trees and vegetation. It is a marine sanctuary, where fishing is prohibited, which makes it an amazing place for snorkeling and diving. The island has a canteen and shops who rent snorkeling gear, but bringing your own will make it cheaper. Once you are done having fun in the waters, take a short hike through the island’s lush jungles. It’s a great opportunity to get a glimpse of local plants and animals – a small sample of what you can expect on the main island. Camiguin island itself is most famous for its black sand beaches. Scattered throughout the whole island, these are the result of the many volcanic eruptions the island experienced over the years. These beaches are mainly found at the barangays of Agoho, Yumbing, Bug-ong and Cabua-an. The contrast between the dark sand and crystal blue water creates a spectacular sight. Don’t worry, the water are very clean and completely safe to swim in. Camiguin is also a world class diving destination, with dozens of diving spots suitable for all levels. The whole island is surrounded by coral reefs which attract a large selection of fish and marine mammals. Thanks to Camiguin’s volcanic nature, the underwater terrain includes some remarkable geological formations, and allows for a lot of interesting and unique dives. Beginners should check out Tangub Bay – a really nice coral reef and just a 10m dive. Over there you can find colorful corals and many type of fish, all scattered around unique rock formations. Therefore, Tangub Bay provides a great taste of what diving in Camiguin feels like. The Old Volcano dive site has some pinnacles formed by molten lava, and a huge selection of marine life living between them. If you are already visiting White island, consider bringing some scuba gear with you. it’s not a deep dive, but currents are usually very strong. The island is home to a truly unique phenomena – the Black forest – a beautiful coral reef all colored in black. Advanced divers should head out to Jigdup Reef and slope – for some of the more challenging dives in the area. The wall extends 45m below water, and has a lot of caves in it where tons of fish and shells make their home. Diving along the walls of this ancient volcano is really an exciting and unique experience. One more diving spot you should consider is the Sunken cemetery – a truly unusual diving site. 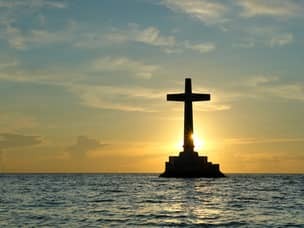 Found at the beach near Catarman, the huge cross is a testament to Camiguin’s rich history. During the 1870’s, a volcanic eruption caused most of the town of Bonbon to become submerged under water. Maybe it sounds a bit bleak to dive or snorkel through an old buried graveyard? The view over there is really unique and just as beautiful as the famous diving spots in the Philippines. Expect to see a lot of corals and different types of fish as you swim through these old ruins. If you are not into diving, standing at the foot of the cross and taking a picture with the lovely view would be a memorable experience on its own. As you might have already guessed, nature in Camiguin mostly means volcanos. There are no less than 7 volcanos on this tiny island, all great for hiking and camping outdoors. The most popular one is Mt.Hibok-Hibok , thanks to the relatively easy climb and the spectacular view from its summit. Climbing the 1332m mountain will take 4-5 hours, so it’s still not an easy task. It’s a truly rewarding hike as you will be making your way through the thick jungle, full of interesting plants and animals. The view from the mountain’s peak is really remarkable. You get to see the whole island, and if the weather is reasonable even nearby islands such as Bohol, Siargao and Siquijor. We will help you find the right tour guide, since getting around these jungles can be quite confusing for those unfamiliar with the terrain. The day tour begins at the Ardent hot springs and that is where you should also end it. These springs with their hot waters are the perfect way to relax after a long day of hiking. Other notable mountains include Mt.Timpoong and Mt.Mambjao. Both are actually higher than Hibok-Hibok, and the view they offer is just as beautiful. You should be aware though, that trekking these volcanos is a much more difficult task. It might take a few days to complete, so be prepared to camp outdoors. Those of you who are looking for a challenge, let us know! We will help arrange everything, and make sure you can complete the trek safely. Make sure you also check out our hiking packages and tours page, where you can find other great hiking spots around the Philippines. Another great attraction in Camiguin are its wonderful waterfalls. We recommend Katibawasan Falls the most, a truly stunning 50m waterfall where you can easily spend half a day just relaxing and swimming in its cool waters. There are a few picnic tables around, so its a great place for families. Another great place is Tuasan Falls -a little less impressive, but the waters there are just as refreshing. It’s definitely a nice place to drop by for all of you nature lovers out there. There are a lot of ways to fill your days in Camiguin, and make them both exciting and relaxing. If you have already tried the hot springs, why not try the Sto. Niño Coldsprings as well? Just like their hot counterpart, these are a natural spring of running water under the open sky, and a great way to relax after a long day in the sun. Another interesting activity you could try is paying a visit to the Giant clams sanctuary. The place is a breeding center, where you can go and see the different types of clams. You can also head down to the beach, do some diving and see these creatures in their natural environment. Since the clams come in many different sizes and colors, it is really an interesting and colorful experience. 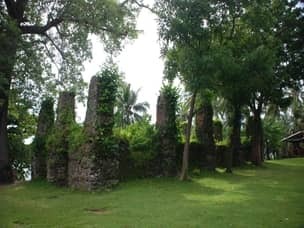 If you are a fan of local history and architecture, consider visiting the Old Spanish church ruins located in Catarman. Not much remains from the church, due to Mt.Volcan’s violent eruption, but it’s still a fascinating sight and a strong testament to the power of nature. There are also a lot of other ancient houses all across Camiguin, dating back to the Spanish and American colonial eras. Just rent a motorbike and tour the island searching for these. How does Camiguin fit into your travel plans? Limited time offer : Rates as low as 50 USD a day! Camiguin is a perfect haven for nature lovers, who wish to relax and marvel at the beauties of its surroundings. It provides a quick retreat from more touristic places around it, such as Cebu, Siargao or Bohol. Moreover, its location between Bohol and Mindanao allows you to include it in a bigger travel plan and stop there on your way to Cagayan or Davao for example. Our Camiguin packages are recommended for couples and families, especially those with an adventurous side. They are all completely flexible and can be easily adjusted to fit your specific needs. It doesn’t matter if you book our pre-made package, or simply include the island in your wishlist for a larger travel package around the Philippines. Either way, our experts will contact you immediately to help plan your trip and make sure you enjoy your time in Camiguin to the fullest. Hi. Can you quote a tour activities for tagaytay (3 nights, will only probably arrive there 3/4pm) and camiguin for (2/3 nights). Hi Nikkie and thanks for the comment! would it be possible for you to fill this quick contact form please? It would make it so much easier for our agents to deal with your request quickly and effectively. You can also read more about the activities we offer in Tagaytay and see if there’s anything there you like. Custom tours are of course always possible as well, so just let us know what type of activities you enjoy. Hello! This early would like to request for a Camiguin package for a group of 10-15 pax. for Holy Week of 2019 (17-20 April 2019). Need to know the tentative cost per person so we can prepare. Would prefer to take the CDO flight, then, take the ferry to Camiguin, if that is possible. Need to know the Hotel amenities. This is all certainly possible, we’d be happy to assist! Kindly fill this form here, and one our agents will contact you ASAP. Do you Offer tours for group of 4 ( 3adults & 1baby) if we’re in Camiguin already? We have already booked a flight for this coming March 16-18,2018. Yes we do, but it depends on availability, especially in smaller islands such as Camiguin. In any case, we’ll help you find a solution that won’t cost you more. One of our agents will mail you later today. Please check out our inquiry from to see what info is usually required if we are to provide good service and make sure you get exactly what you are looking for. Our email address is shown there, so you can either fill out the form or mail us directly, it will be the same. If you are just looking for a ballpark figure then that’s exactly what the package table at the top of this page is for – you can look there and get a pretty good idea of what our package prices are like.